A user can use rich user interface controls in Pega Intelligent Virtual Assistant™ (IVA) for Web Chatbot because Pega Platform™ also includes a framework for advanced user interface controls. With the introduction of support for a date picker control and the ability to add file attachments while a user is chatting with the chatbot, the system provides a richer and more robust user experience and helps the user accomplish tasks more quickly without the need for complex validation messages. 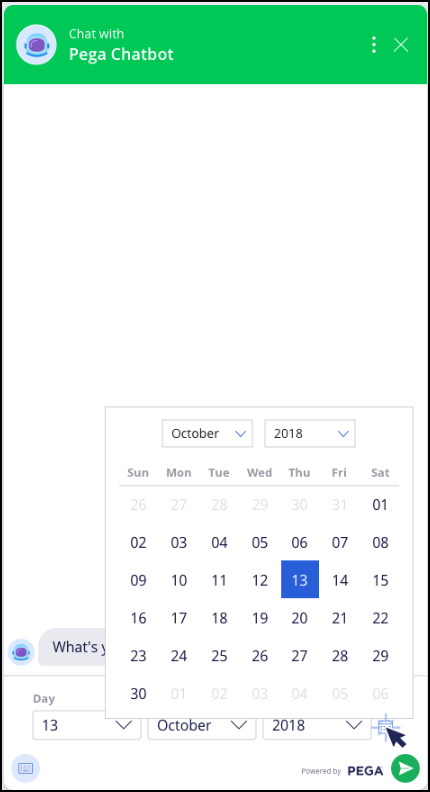 The date picker control is displayed in the chatbot based on a question rule format or based on a case property type, if a question rule format is not defined. When a user is chatting and needs to enter a date in the chatbot, they can easily switch between the date picker control and simple input text mode. A user can add file attachments in the chatbot both when they are in a case context and when they are outside of a case context. When a user is in a case context, file attachments are part of the processed business case. The file attachments are automatically assigned to an interaction case when a user is outside of a case context. For more information, see Configuring the Web Chatbot channel.